Gordon Smith, who was first elected to county office in 1988, is retiring. He served 16 years as the county treasurer/ex officio collector and the last six years as recorder of deeds. During the last 22 years, Gordon Smith has collected many memories and amassed a fair amount of records within the walls of the Livingston County Courthouse. Come this Friday, the elected official will record yet another transaction as he officially retires from the office of recorder of deeds. 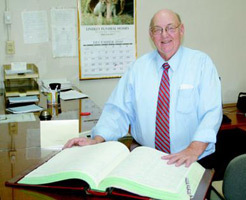 Smith has held countywide public office since 1988, serving 16 years as the county treasurer/ex officio collector and the last six years as recorder of deeds. With a resounding voice and a common sense approach to whatever the task, the popular Democrat has been a fixture at the courthouse for more than two decades. His current term expires Dec. 31, 2010. Smith, 70, chose not to seek reelection, stating that he had no particular plans in his retirement other than visiting children and grandchildren who are scattered throughout the region as well as in Florida, Texas and Colorado. Smith says he is looking forward to this new chapter in his life. During his years at the courthouse, Smith has seen many changes - mostly new faces and new technology. But, his service to the taxpayers of Livingston County has remained constant. "Over my years working for the public, I have tried to work for them as I would for my own business," he said. Although serving in an elected office for 22 years, Smith has amassed a lifetime of working for the public, including many years involved in the grocery and restaurant business. Early in his career, Smith was involved in the grocery business at Stop and Shop Grocery, at the southeast corner of Washington and Ann streets, later moving the store to the current Piggly Wiggly location. He recalls the days when bananas were 10 cents a pound, whole chicken fryers were 19 cents a pound and ham sandwiches were sold at four for a $1. Smith later transformed the old Stop and Shop site at Washington and Ann streets into a family restaurant, Taster's Choice, which he later moved to the area of U.S. Highways 36 and 65 where McDonald's is now located. Other business ventures Smith had were the Chuck Wagon Restaurant, Sale Barn Restaurant, Strand Hotel Restaurant, the Lock Springs Grocery Store and a Grocery Store in New Franklin. Smith was born and raised in the rural Galt, Mo., area. Immediately following high school graduation, Smith's agriculture teacher organized jobs in the northwestern states and California for a group of boys. So, off they went to seek their fortunes. One might say his first job was as a migratory worker at various vegetable and fruit farms. After this, Smith came back to Trenton and took at job at Trenton Foods as a pneumatic instrument specialist. He began taking courses at Trenton Junior College and saved enough money to buy a small farm. He worked on and off at his brother's grocery store in Galt. Eventually, Smith graduated from Trenton Junior College and sold his farm for money to attend the University of Missouri - Columbia, where he met his wife, Rosie. In 1966, Smith graduated from MU with a degree in industrial management and a minor in accounting. After working a year with Ford Motor Company in Detroit, Mich., he and Rosie returned to Missouri. Smith was business manager at the Training School for Girls, which is now the women's prison, for six years. Smith has been an active member of the men's Democrat Club, having served as president, vice president and secretary. He was also recipient of the Jerry Litton Leadership Award. He is a member of St. Columban Catholic Church and has served as parish council president. Smith has also served as a member and president of Community Options Board of Directors, a member of Indian Hills Nursing Home Board of Directors and was part of the steering committee for a fund-raising drive to build Peter Pan School. He and Rosie have seven grown children - six girls and one boy, and nine grandchildren - eight boys and a girl. Upon his retirement, Smith bows out from public office graciously. "I have appreciated all of the community support I received in my elections and hope the people of the county have appreciated my effort to do the job of county treasurer and county recorder of deeds," he said. Smith is appreciative of the public's confidence in him during his years in office. "I want to say thank you to all those people who have worked with me during these years," he said. "And, thank you to everyone on behalf of my family."